Today we’ve got some fabulous low carb rolls for you! These took a lot of trial and error to get right and we think we’ve honed in on a pretty tasty dinner roll recipe here. These low carb rolls come out to be very soft in the middle with a little bit of a crust. 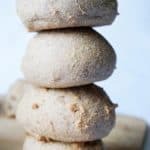 They can also be used as hamburger or sandwich buns and in addition to being keto friendly, they also pack in some fiber! We do a lot of testing behind the scenes in order to lock in on what we are confident is a good enough recipe to share with you. One weekend we made a bunch of different mini test loafs using different flours, wet/dry ratios and a bunch of different add-ins and flavorings. This dinner roll recipe started on that weekend, but by the time it made it’s way to our blog it has undergone countless modifications until finally we ended up with this recipe! To date most of our recipes use almond flour, and we’ve always been partial to it since we’ve found it easier to work with. It’s just easier to come out with a nice moist low carb bread than it is when using coconut flour. Recently we’ve made it a goal of ours to master baking with coconut flour. We’ve made some really good progress so far. It turns out that psyllium husk powder is great in conjunction with coconut flour. The coconut flour absorbs a tremendous amount of liquid, making it difficult to come away with a soft and fluffy bread. Using psyllium husk powder helps to counteract this and also gives the keto bread a bit of a lift. It helps with the rolls expanding in the oven. Our next goal is to continue creating psyllium husk recipes as it adds a much need softness to low carb baking! The baking time for these is something I’d encourage you to play with. You can go as little as 20 minutes and come out with a soft and chewy roll, bordering on under-cooked. On the flip side you can also go as high as 35-40 minutes to get a more firm and crunchy crust on the roll. I personally like to go about 25 minutes to achieve a soft texture. As pictured in the video we use a silicon baking mat for these low carb rolls. This is a kitchen tool that we’ve found to be invaluable. We use it nearly every day now and would highly recommend it to anyone. If you’re in the mood for some good low carb bread(and who isn’t?) we’ve got a few more recipes you might like to try. Our keto bread is the most popular recipe on our site! If you’re in a sweet mood then give our cream cheese bread a try. Start by combining all of the dry ingredients(coconut flour, psyllium husk powder, baking powder, salt) and mixing thoroughly. In a separate bowl start beating the eggs with a hand mixer. Add in melted butter and water and continue to mix until combine. Pour the dry ingredients into the wet and continue mixing until the dough becomes thick and well mixed. If dough is not easily shapable by hand continue adding more psyllium husk powder until it is less sticky. For the desired consistency see the video above! Form into 10 dinner rolls and place on a greased baking sheet or silicon baking mat. Larger rolls can be made if desired, just add a few minutes onto the baking time. Bake for 30-35 minutes at 350 degrees. Enjoy!